Who knows about HAARP having these Digisonde Triangulation Measurement Sensor Stations? One is in each: Gilbertsville, KY, Beebe, AR & LaBarre, LA....all three were mass killsites of birds recently. HAARP is aimed at the approximate locations of these Sensor Stations or receivers, then fine-tuned to insure the energy field is precisely on target. This triangulation of stations is placed at 120 degrees in an Isosceles Triangle. The epicenter is then in the center of the long line of the furthest points and is where the auroral ionospheric energy will be at maximum during HAARP transmission. This focus point is in this key position of the sensor stations in the aforementioned towns in KY, AR & LA and happens to be on the New Madrid Fault Line! Ten major natural gas pipelines and underground nuclear facilities along that fault line would rupture and disrupt service to hundreds of thousands of people, as well as cause massive radiation to the area. Oak Ridge Laboratory in Tennessee has sealed off rooms of radioactive equipment that were meant to never be opened again. 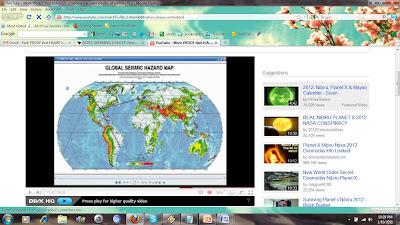 The Global Seismic Hazard Map shows a straight line death zone of birds, fish, etc in Gakona, Alaska, Gilbertsville, KY, Beebe, AR¸ LaBarre, LA, Port Orange, FL, Rio de Jainero, Brazil, Valkoping, Sweden and the list is growing. National Level Exercise 2011 (NLE 2011) is scheduled for May 2011 when FEMA will simulate the catastrophic nature of a major earthquake in the central United States region of the New Madrid Seismic Zone (NMSZ). The year 2011 is the bicentennial anniversary of the 1811 New Madrid earthquake, for which the NMSZ is named. NMSZ will be the first NLE to simulate a natural hazard. Remember that TPTB have planned exercises mimicking catastrophes in the past. Two that come to mind were carried out on September 11, 2001 in New York and on July 7, 2005 in London. All Ambassadors Called Back to Washington!